A gorgeous April day and a beautiful Montana cutthroat are reasons to celebrate. Tim Linehan—of Linehan Outfitting Company in Troy, Montana (and former Trout Bum of the Week and 2013 Orvis-endorsed Guide of the Year)—sent in this shot of a client’s sweet. . . Welcome to another edition of our trivia challenge, where we test your knowledge of all things fly fishing and where you might learn a thing or two about this sport we love. Sorry for the two. . .
Saxon Eastman plays with Wrangler, who will become a guide dog for the blind. 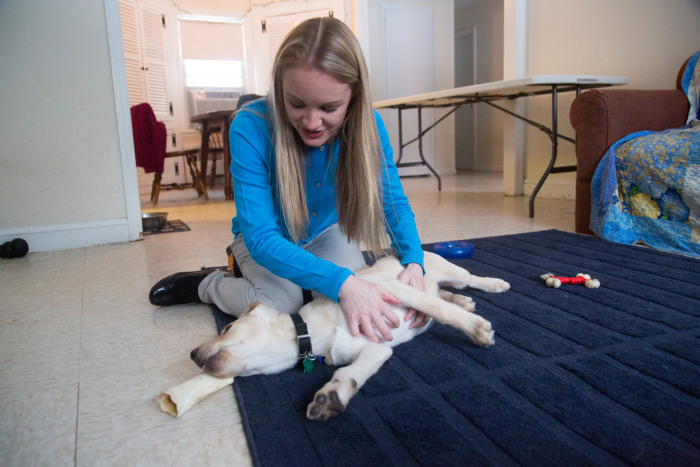 Have you ever wondered what it would be like to raise a puppy for a service-dog organization? Puppy-raising is a vital step in a dog’s journey to becoming a working service dog, and the. . .
Filmmaker RC Cone spent lots of time in Iceland last year, working on a project called Yow: Icelandic for Yes! Here’s a killer short of guide Shane Stalling fishing in a canyon of the. . . I was very excited to see my old friend, Cayenne, who has been on this blog many times. Last Saturday, Orvis held its third annual Down the Hatch Fishing Festival in Missoula, Montana. The event—part of the Orvis Guide Rendezvous—featured live music, a chance to try out. . . This is hardly a high-quality video production, but the locations and the trout more than make up for any technical deficiencies. Two anglers head deep into the New Zealand backcountry in. . .
Nathan Schneck and his service dog, Husker, take a walk on Sunday. Many times, we have posted about folks who have had problems in restaurants with their service dogs, but in the vast majority of these instances, the dog owner doesn’t have an obvious. . .
For those anglers who fish tailwaters or spend time trying to catch trout during winter, scud imitations are vital. But these little crustaceans also exist in lakes, ponds, and spring. . .
Gus photo-bombs Jayme Erickson’s photo with a Bitterroot rainbow. Being a boat dog is hard work. You’ve got to keep from getting tangled in line, you’ve got to avoid jumping up on an open fly box, and you never even get to cast. Every time you meet a nice. . . If the car is too hot for you, then it’s too hot for your dog. A police officer in Strongsville, Ohio, had a novel approach for dealing with a woman who had left her dog in a hot car with no ventilation: He made her sit in the same car for a few. . .